As Sri Lankans, our own national interest must come first. This includes both safeguarding the integrity and sovereignty of Sri Lanka and also ensuring that all our citizens can dwell contentedly in their country, with access to equal opportunities and full participation in politics and development. 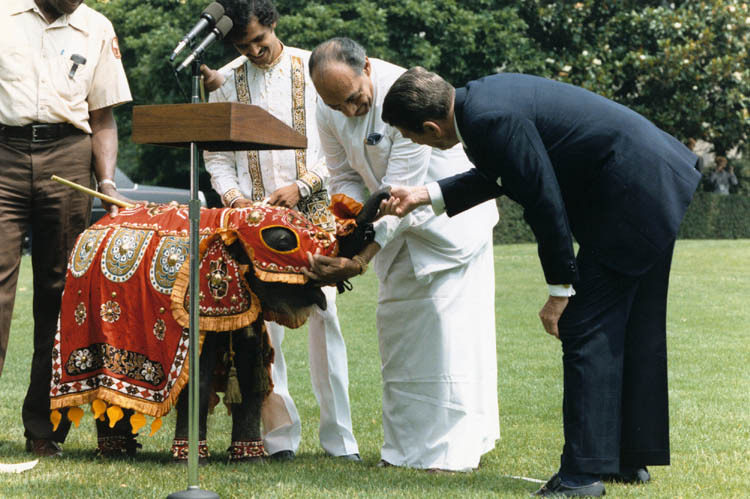 As South Asians we must also recognize the important role India plays in the region. This means that, without any violation of our own interests, we must ensure that India does not come under undue pressure from any quarter because of us. It is clear that we got into a conflict situation with India because we violated the second principle. While India could have reacted less aggressively, I believe the Jayewardene government must be held responsible for allowing India to come under pressure from two quarters. The first was pressure from Tamilnadu, because of what was perceived as, not just discrimination, but also violence against and oppression of Tamils. The second set of pressures however was more worrying for India, as is clear from the provisions of the Indo-Lankan Accord. 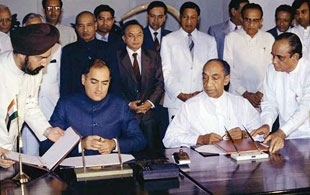 The Sri Lankan agreement then to ensure that foreign policy decisions took Indian interests into account (as spelled out with regard to Trincomalee and its oil tanks as well as broadcasting facilities to other nations) made it clear that Jayewardene’s flirtation with America in the Cold War context had worried India deeply. 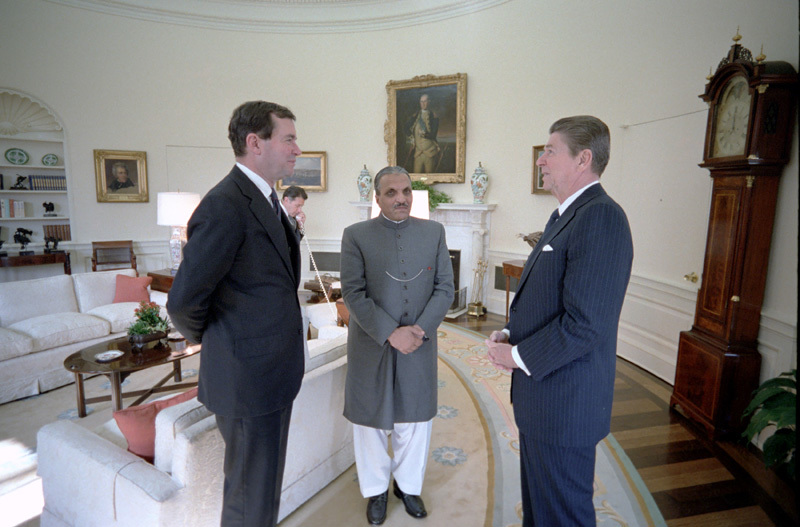 We must remember that those were days in which America saw India as a hostile element, and had no scruples about engaging in activities calculated to destabilize the country. Salman Rushdie’s brilliant account of language riots in India in the fiftes, in which Tamilnadu hostility was the most aggressive, has a brilliant cameo in which he suggests the American contribution to street violence. And while obviously no direct causal connections can be diagnosed, there is no doubt that America would have been quite happy in those days for India to split up – and the obvious instrument of this would have been Tamil Nadu, with the longstanding American connection to the area, through missionaries in particular. By the seventies India had emerged as a strong and relatively united nation, though the pot did not cease to bubble, as was seen in the Punjab in the early eighties, and as the continuing Naxalite problem indicates. But most worrying for India were tensions in Kashmir, and what seemed unremitting external involvement in the promotion of terrorism – as was illustrated most graphically when the only victims of the American counter-strike in Afghanistan to the Al-Qaeda attack on the USS Cole were terrorists being trained for activities in Kashmir. The irony was that Al-Qaeda had initially been encouraged by the Americans, in their deployment of fundamentalism to get rid of the Soviets from Afghanistan, a stratagem that as we see they have continued to deploy, in Libya and Syria as well as elsewhere. They provided funding for Pakistan under General Zia to train terrorists, and quite naturally General Zia and some of the more extreme elements in the regime he had set up thought it right and proper to use this funding for terrorism in India too. Naturally too, in the Cold War context, the Americans did not see anything amiss with this, though I would like to think they did not actually encourage it. In such a context it is understandable that India was deeply disturbed by Jayewardene’s efforts to enter the Cold War on the American side. Given his scarcely disguised hostility to India’s Congress government, his provision of facilities for the Voice of America, and his efforts to promote American usage of Trincomalee and the oil tanks, were to my mind culpable, and amply explain the Indian reaction. That was the main reason for Indian intervention, as is clear from the fact that, once we had signed on the dotted line, and promised not to engage in such adventurism, India ceased to worry about us. We got nothing but unstinting cooperation afterwards, and we should never forget the sterling support India provided to us to deal firmly with the Tigers. I refer here not only to the last few years, when there was so much pressure from the West to let the Tigers off the hook, but even earlier when Indian support helped us overcome some of the more threatening aspects of the Cease Fire Agreement and the incapacity of the Wickremesinghe government to stand firm against Tiger pressures. But whilst safeguarding its own integrity and security were and are the Indian priority, we must also remember that it must also keep its own citizens content. Therefore we should help India avoid pressures from Tamil Nadu with regard to the welfare of Tamils in Sri Lanka. I should note however that doing this will help us to fulfil not only the second principle I noted above, but also the first: we owe it to ourselves to make sure that all our citizens are content, and have equal access to opportunities, and in promoting this we will help India also avoid internal pressures. In this context we should recognize that India has not asked for much. The Accord introduced Provincial Councils, but we must accept that there was no alternative, given that Jayewardene had ensured that the District Councils he had set up earlier were totally ineffective. Having started them off on a negative footing with the appalling antics in Jaffna of Cyril Mathew and his cohorts during the DDC elections in 1981, he proceeded to starve the Councils of funding and turned them into a joke. In order then to ensure effective local input into governance, it was essential to introduce a unit with greater authority. … there is no doubt that America would have been quite happy in those days for India to split up – and the obvious instrument of this would have been Tamil Nadu. But we should note that the Accord severely limited the powers of Provincial Councils. National Policy on all matters remained the prerogative of the Central Government and, with regard to what was an excessively large Concurrent List, it was noted that, in the event of any disagreement, the will of the Central Government would prevail. Unfortunately given the lack of any understanding of principles of governance, in both Jayewardene and the regimes with very different priorities that succeeded him, we failed to establish clearly the parameters through which Provincial Councils could function effectively within the limits laid down through national legislation as to the policies they must adhere to. Conversely, because of the incapacity of most Provincial administrations, we did not see active use of the powers available under the Concurrent List, with regard for instance to education, which would have made it clear both what Provinces could achieve, and how this was no threat to the Central government, provided it made clear the policy framework to be followed. Given then that we have not really seen effective implementation of the 13th Amendment, it would make no sense to agitate now for its abrogation, either to do away with devolution, or else to increase the powers of devolved units. However it does make sense to promote clarification, not necessarily through amendment, but through the development of guiding principles as to how to enforce National Policy while promoting local initiatives, and how to resolve conflicts through consultation before resorting to legal mechanisms. At the same time we should also move towards greater devolution to smaller units, because we have seen, in areas in which Provincial Councils have exercised power, appointing teachers to schools for instance, that they have been as useless as Central Government in providing solutions to the real problems people face. In this regard I have no doubt India would be supportive, since when the 13th Amendment was introduced India too had only two principal tiers of governance, but since then they have moved forward in a way I believe they would want us to emulate too. The introduction of the Panchayat system in the nineties suggests that they saw the need for bringing governance closer to the people, and this is something we can easily move to ourselves, in fulfillment of the President’s commitment to add on to the 13th Amendment for the purpose of empowering people more. As he had already indicated, in stressing in his manifesto too the need for a Second Chamber, 13 plus does not mean increasing the power of Provincial Councils. It means furthering the fuller participation of all our citizens in politics and development. One important element in that is increasing the input of the regions in central decision making, and we should for that purpose adopt the system in use in almost all other countries with regional differences, namely a Second Chamber based on equal representation for all regional units. Adding on mandatory representation in the Executive for representatives of all regional units would also be an addition that would strengthen the link between people and government. I believe then that India would be perfectly happy with the basic principle of the 13th Amendment, which is Provincial Councils with limited but effective powers. They would also welcome, and I think we should provide this so as to lessen the various pressures to which they are subject, much greater consultation of the people of the North and East with regard to development issues as well as social welfare measures. In addition to institutionalizing this through a Second Chamber as well as more effective local government, we can immediately ensure mandatory local consultation through instructions to Grama Niladharis to discuss both development and protection issues with the citizenry, and report formally to the next level of administration. Equally that level should ensure rapid responses to any problems brought to its attention. Finally, while I believe we should do our best to assuage Indian concerns, I believe India should also help the Sri Lankan government to assuage Sri Lankan concerns. I had mentioned previously to Indian interlocutors the damage done by continuing insistence on the part of the TNA on a merger of the North and East. Though I have been reassured, including by elements in the TNA, that this is only a bargaining point, it raises serious concerns about separatist tendencies. Instead of playing into the hands, as it were, of those opposed to any form of devolution, India should make it clear that the merger – which is about power to politicians, not power to the people – is not on the agenda. That would immeasurably reassure those concerned primarily with the integrity and sovereignty of Sri Lanka, and help them to work more actively to promote full participation in politics for all our citizens. And that in turn would relieve India from the pressures with regard to Sri Lanka it faces from so many quarters.